Are you ready to find the most incredible creature of our time? Explore the island to find the Kong. 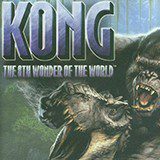 Kong is a huge ape that doesn't like to get interrupted. Well, sometimes people do silly things and interfere animals from their activities. What it will do now?